But thanks for eagle eyes, David V. who reminded me and thanks for ALL who stepped up fast with photos of Leak Less and Lightning … thanks! So, I have uploaded the revised version … since I had to add some pages, there is now info on the Pixar Motorama McQueen also! 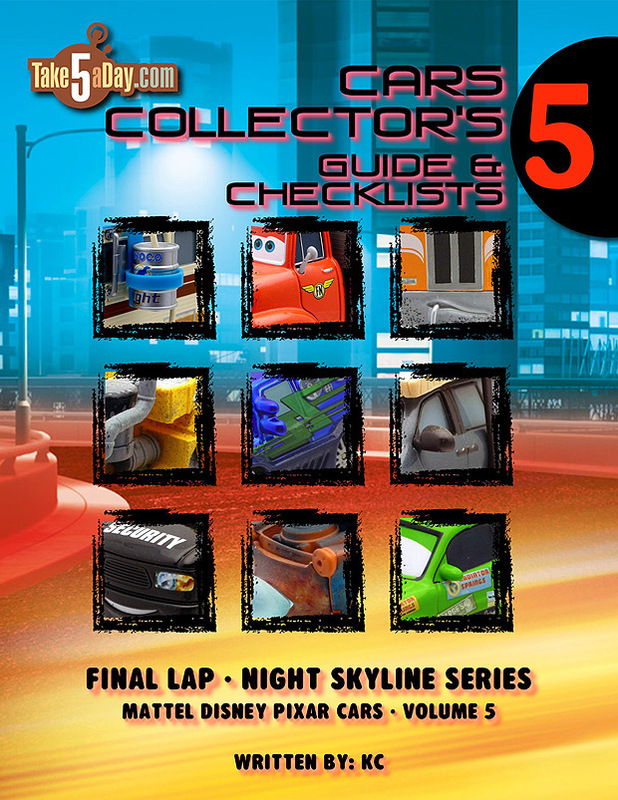 With the last Night Skyline releases (rubber tire Chick, King & Lightning McQueen) in the bag and in the books, it’s time for the Final Lap-Night Skyline magazine & checklist! Click on the cover art or the link above to go to MagCloud to get your issues printed on demand – now worldwide ordering is available. There is also a FULL PREVIEW of the issue on the cover at MagCloud. As you can see, it includes every Final Lap and (classic non-moving eyes) Night Skyline release. Lenticulars will get their own issue soon. Remember, your order supports TakeFive, so thanks! Or you can find all of our issues HERE. 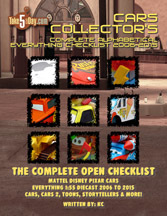 (Note: I am working on updating the OPENER issue to have a complete CARS 1 checklist magazine issue – the current one is 2006 to June 2010). If you got in an order before I placed the issue on HOLD, drop me an email with your order number and I’ll send a replacement when I order my issues – sorry and thanks again for your support of T5! I think I caught them before it was printed but if not – the new version now contains half a page on the Pixar Motorama McQueen – so if you do NOT see it in your issue, drop me a line to replace it – thanks and sorry! Two Questions – Does anyone actually want a lenticular checklist? And B – interest in a digital version? Basically it would be a PDF file you can read or upload-read on your smartphone-iPad? Unfortunately, it’s not interactive so you can actually use it as an electronic checklist … but let me know what your interest is in the comments below. I also would want a Lenticular checklist. When we were Freshman, the Seniors (Desert Art) were legendary. They were the originals. They led the way. When you saw them in the halls you couldn’t help but gasp. There was one particular guy and one particular girl who if you saw them, you were actually speechless. The Juniors (Supercharged) were a little closer in age, so they were really nice to us and we were alway excited to see them. And for the most part, a lot of the previous Seniors would pay us visits after graduation; the guy from that class who made me speechless actually got arrested, so we didn’t see him for a few years. And the girl who made me speechless, well she didn’t visit as often as the rest. The Sophomores (World of Cars) were pretty cool. Some of them were “New!” transfers but we still knew them all pretty well from our grade school days. The previous two classes were back to visit a lot too. But that girl who always left me speechless from the Senior class only made a brief appearance around Spring Break. Then there was my class; we were the Race-O-Rama generation. LOTS of characters and personalities. We were everywhere and did a lot together. Those were some special times. This was about the time however, when I realized that the girl from the original Senior class would not be back for a visit. I still cry when I see her in the yearbook. The Juniors (Toons / Storytellers) were quite the collection. We knew a lot of them pretty well, and they even shared some classes with us. Some of my class refused to accept them because they weren’t canon (whatever that meant), but since a lot of them have gone on to bigger and better things, I think they are more accepted now. The Sophomores (Final Lap / Night Skyline) weren’t around much. I don’t know if it’s just the fact they were housed out in the “temporary” trailers and not in the big building, but I know for a fact that a lot of them dropped out of school. I even heard that a whole bunch of kids registered but never showed up. Hard to tell if the records from another school got crossed up or if they never really existed in the first place. When I look back at the yearbook, there is a section called “Not Pictured”, and there are several pages of gray portraits with their names underneath. The Freshmen (Lenticulars) were comprised of about 50/50 younger siblings from all the classes before — we totally ignored them — with the other 50% being a random assortment of haphazard characters. When I look at the yearbook now, I don’t even recognize some of the faces and I would swear that a lot of them were really never at my school. So I say bring on the Lenticular issue, it is a necessity! (MET: Can’t argue with this much logic. 🙂 ). No interest here for a lenticular one. We started our collection with the lenticular cars and my son loved them. But as our collection grew, we started getting more and more fixed eyed ones because of the rubber tire race cars, Final Laps, and boxed sets. As soon as we got fixed eye McQueen, Chick, and King, my son refused to even play with his lenticular versions anymore. He will tolerate lentys for minor characters, and you can get away with having a lenty for a character with a split windshield. But those 3 lentys have been banished to the back of their haulers. Love your Opener book and when the update is ready, we will order that and an Expanded Universe checklist. I hate the lents, I wouldn’t want one either. Seriously, who loves them? I know some people like them, but I’m sure even they still prefer fixed eyes. I want to collect the magazines the same way I collect the cars – by having something I can hold in my hands. But that’s just my preference. A digital version would be great. Kind of like Tom Cruise in “The Minority Report”? You could pull up several issues at once, and move them around the wallscreen and flip pages with your hands. I like it!! I will have to place my orders…but shipment to me is not so cheap..
Oh yeaaah. I will be ordering this one. I bought the Opener’s issue, and the World Of Cars issue for the Speedway Of The South coverage, and they are worth every penny. I love the commentary that comes with these as well. I just have to be careful showing these to Jr. Manifold. If he sees it, then he wants it – heh heh. Thanks for the excellent work, Met! Met, I just checked out the preview and I didn’t see the Night Skyline Lightning McQueen Pit Row Launcher. Do you need a pic to do an update? Jake,, is that the LM Pitrow or Pitrace off launcher that came with Chick Hicks? What others were in that case? If I remember right wasn’t that with the Sparemint and Sputter Stop? I know a few of my launchers are photographed in that magazine. We love the checklists, keep ’em coming! It appears the only Cars we missed out on are Vinyl Toupee hauler, Brian Park Motors, Chuck “Choke” Cables and Stu Bop. And all the ones Mattel never released. Vinyl Toupee & Shifty Drug came out together in the same case at a handful of Targets across the United States, so I’m guessing you meant Shiny Wax Hauler? No, I mean Vinyl Toupee. We never found that one, our Target was not in the handful unfortunately. Why are Elvis, TJ, and Sven listed twice? GREAT STUFF!!! My order will be going in ASAP. Thanks for the hard work that goes into these guides. This should be an interesting issue. The Nightskyline series. Went out with a whimper. USA releases only, international releases only. To complete this set you had to trade or buy with collectors across borders. Thank goodness the Disney Cars collector community is so accomodating and helpful. (MET:All the intl ones are included… And everyone’s fav-the Easter eggs 🙂 ). Further proof why this is the best site for Cars fans around the world! I must admit, my PayPal donation skills have become rusty as of late, but I hope everyone is clicking that button on the upper right from time to time. Once again John I have to agree wholeheartedly about this site being the BEST. I have said it before all will continue to say it: It is Met and Tiz’s everyday oversight, the content and how things our run here that makes it so great. I really appreciate the information and the allowance for thread drift that gives us the freedom to discuss other aspects of Cars as well as life. Everything is connected in one way or another anyway. I couldn’t imagine anyone doing a better job at running a site than what is done here and that is why no other site can thrive like Take 5. Hey that’s a good motto. Come Thrive at Take 5. :). Thanks as always for the checklists. I would like to know what happened to the last final lap Cars and other releases shown in the collectors guide like wrecked Hudson Hornet though? We will ever see these or were given false promises and Mattel will never put these out? I would really line to see a classic line? Will we? and how about the toons? Are they returning anytime soon? We will be ordering the Opener Update. My son and I love the one we have. But thanks to that magazine, Apple, Bubba, Race Damaged Mood Springs, the cousins, and the showstoppers will now have to be tracked down. Going to go slow and one by one with those. But it is cars like those that make this fun. The hunt will never really end. Thanks for all your efforts… this should be another great magazine… it’s time to collect them all.